Hi, my name’s Captain Buddy Ferber. 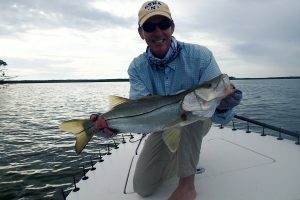 I’m an Everglades fly fishing guide residing locally and fishing the waters of southwest Florida. Although it sounds like a bit of a cliché, I didn’t start Spirit of the Fly for the money. I did it because I’m truly passionate about fly-fishing in the Florida Everglades and I want to share my love for this sport with others. I’ve spent approximately 16 years exploring the remote corners of Everglades National Park and 10,000 Island National Wildlife Refuge. 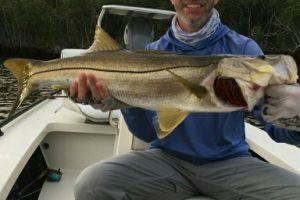 During this time, I’ve located some prime fishing spots and learned some effective techniques for hooking tarpon, redfish, snook, and other warm water species. Now, I want to share everything I’ve learned with other anglers, whether beginner or seasoned. By offering guided tours through Spirit of the Fly, I can enjoy working at what I love to do every day, while helping folks like you have a great fishing trip. I’ll go the extra mile and spend additional time if needed to make your day successful! Please feel free to compare my rates and services. Click here to have a look at my prices. Spirit of the Fly specializes in personalized fishing tours for up to two anglers at a time, a maximum three of us combined. When you hop aboard my 17-foot flats boat, I’ll also provide you with the rods and tackle you’ll need. Please drop by the Boats & Equipment page for more details. I’m thrilled to have integrated my “lifetime” of fishing experience into my profession as a licensed fly fishing guide. After all, I‘ve been fly-fishing since I was 16. Somewhere along the way, I had a dream and knew that one day I’d be sharing my lifetime of fishing experience and stories with fellow fly fishing enthusiasts. 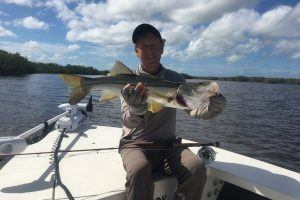 Whether you’re new to the sport or have been casting for decades like me, I’d love to show you some of my favorite backcountry fishing spots charted in the remote Florida Everglades over the past 16 years. And each year, depending on a number of factors, new locations are charted. If you’d like to get to know me a little better before booking a trip, please click here to read more about my experience. I think you’ll get a much better understanding of who I am and why I love this sport so much. Schedule your Everglades fishing tour right here!